It takes a lot to happen for a cricket fan to get riled up about an ODI bilateral series. There is a good reason for it. Seldom, do a bilateral 50-over series go into the 4th game with the stakes still on the line. One side most often than dominates the first three games, and the last matches are merely reduced to a dress-rehearsal for the bigger picture- in the present case, that bigger picture is the World Cup. The odds against having a competitive series gets stacked even more where the two teams' in question have had contrasting fortunes in the past 12 months, like India and Australia. While India has been virtually everything, for Australia- the reigning champions, victories have come like gold dust- few and far in between. The contest itself threatened to be an overkill considering India's 3-month grueling tour Down Under just a few days ago. So, when Australia landed on Indian shores, no one was talking about the result or the scoreline. All the talks were around how will India go about trying to finalize their best possible XI for the World Cup or whether Australia will be able to give a challenge to India; some even questioned whether they'll win a single ODI in the series. Three games into the 5-match series and we are in for a potboiler. After running India close at Nagpur and Hyderabad, Australia finally registered a rare win, toppling the Men in Blue on a dual-paced track at Ranchi. After a forgettable 2018, Australia can finally see some light at the end of what has been a long tunnel. Aaron Finch, who seemed to have a rut so deep, that once a revered white-ball batsman was beginning to look a pale shadow of himself, seemed to have finally turned a corner with scores of 37 and 93 in the last two games. One of the primary reasons why Australia have struggled in the past 18 months, is their inability to stitch century stands. Since the end of 2017 Champions Trophy, the Aussie batsmen have stitched just seven-century stands; the lowest in the World as compared to India's 36, testifying the difference in both sides' fortunes. At Ranchi, Usman Khawaja and Aaron Finch laid a perfect base for the middle-order, testifying the significance of a long partnership. That Australia's middle-order was not able to make full use of the platform is another issue that Langer and co would like to address if they are to continue their progress in the right direction. Ranchi ODI also showed that Australia has the bowling to challenge India if they can put a sizeable total on the board. The decision to give Pat Cummins the new ball has proved to be a masterstroke, as the right-hander has got the ball to swing both ways and have not allowed the Indian openers to get away. Jhye Richardson also impressed in his maiden outing while Adam Zampa once again proved why wrist-spinners are the order of the day in white-ball cricket. He may have gone for runs, but Zampa has posed a constant threat every time Aaron Finch has tossed him the ball. At Ranchi, he knocked over MS Dhoni and Virat Kohli to effectively sway the game in his sides' favor, and will once again be the key bowler for Australia, especially against Kohli, at Mohali. Mohali's wicket, which generally has a good carry might force Aaron Finch and the team management to play Jason Behrendroff ahead of Nathan Lyon, who has looked ineffective in the series. Behrendroff has been pretty effective against India's top-3- especially Shikhar Dhawan and can be a sizeable threat, considering the bad form of India's openers. Speaking of India's openers, it's not panic situation yet, bit the team-management will hope they shrug off their lean patch at Mohali. India's batting success in the past two years has essentially been built on their top-3. With two of the three out of form, and Ambati Rayudu struggling at No.4, it has put a Brobdingnagian pressure on Virat Kohli. Kohli has been batting on a different level. In the third ODI, he scored his second back-to-back ton [41st], but the result proved that the Indian captain cannot do it all by himself. Ambati Rayudu's form and the manner of his dismissals have been hugely disappointing. His perennial struggles against quality seam-bowling have once again raised questions about his credentials of going to the World Cup as India's No.4 batsman. So, if Kohli is to bring KL Rahul in the side in the 4th ODI: Whose place should Rahul take- Dhawan or Rayudu? And, what about Rishabh Pant? With MS Dhoni resting for the last two games, Pant will surely get two matches, and with Rayudu not performing, these two games provide him the ideal chance to stake a claim to the No.4 spot. Which now brings us to India's combination. The match at Ranchi once again showed the value that Hardik Pandya brings to the ODI set-up. With Pandya in the team, Kohli has the luxury of playing both their wrist-spinners. One of the reasons why India have been so successful in ODI cricket is their wrist-spinners provide them wickets in the middle overs. With Pandya not available for the series, India had to drop Chahal in favor of Jadeja and to accommodate Vijay Shankar in the playing 11, which has resulted in Kohli being forced to use Jadhav as the fifth bowler. Ranchi ODI has vindicated that Shankar and Jadhav are essentially the sixth-bowling options and with Jadeja's ability to take wickets on a flat track and his hitting ability at the death, which was essentially the reason why he edged out Chahal from the playing 11, on leave, India is basically to three genuine bowlers; as was the case in the third ODI. It is important as to how India look at Shankar. If they see him as the genuine all-rounder, then, playing him and Jadeja in the same team will dilute their bowling unit, especially on a flat deck. Head Coach Sanjay Bangar stated there will be changes to the playing 11; one of the questions that arise from it is- what about Bhuvneshwar? Which fast bowler will he replace in the playing 11? Looking at Australia's record at Mohali, 5 wins in 6 games, one would suspect they feel more at home at this venue, more than any in rest of the country. The Mohali wicket is generally a hard pitch with the fast bowlers getting some assistance. With it being a large square, targeting the shorter side of the boundary as well as running between the wickets will be the key. Virat Kohli scores his second consecutive ton- a sublime 123 at Ranchi. 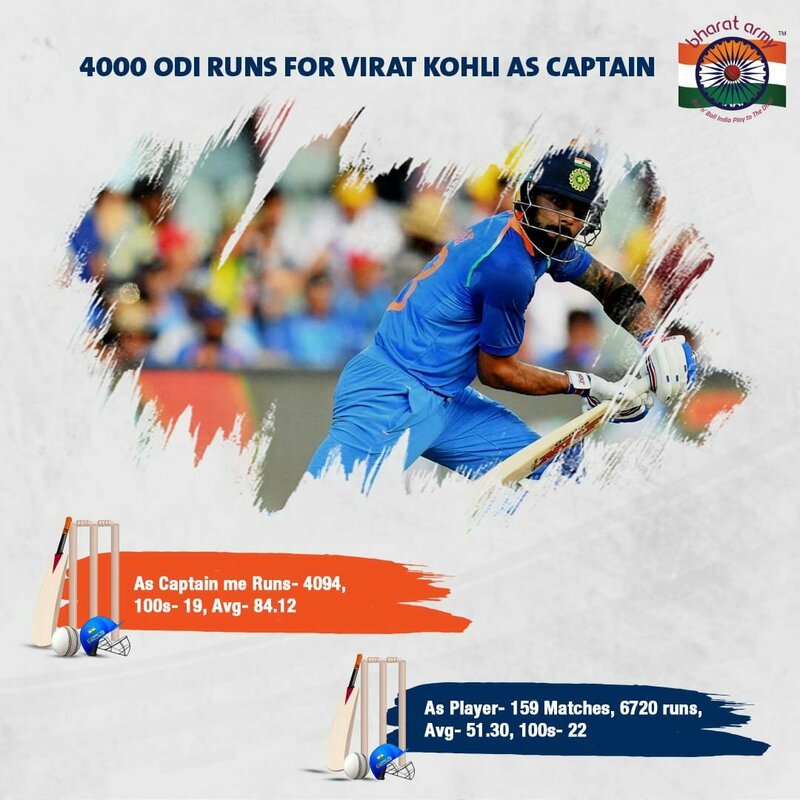 During that course of the innings, Kohli became the fastest captain to score 4,000 ODI runs. 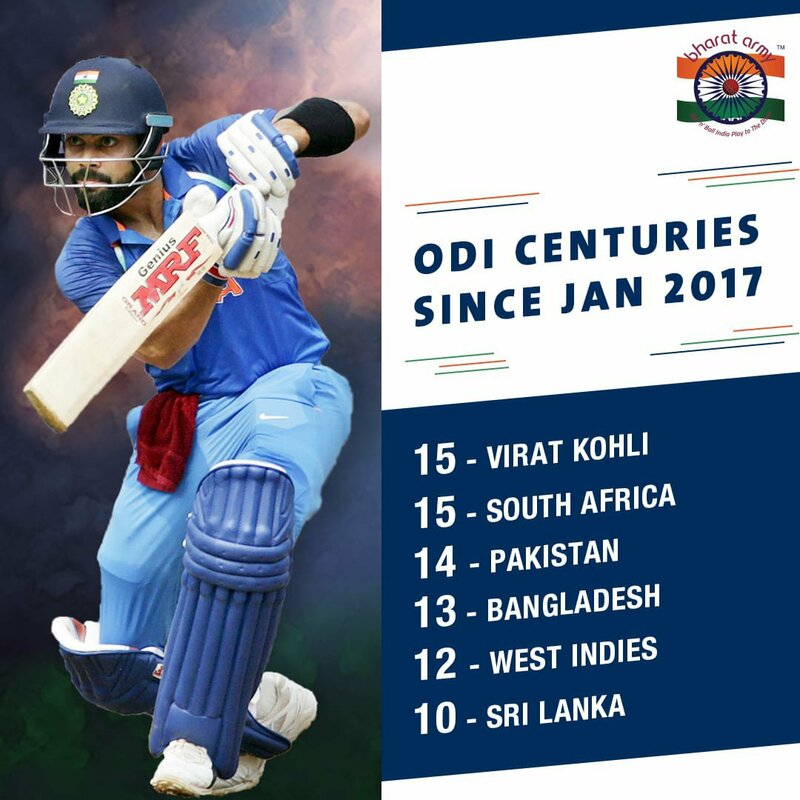 This was Kohli's seventh ODI ton in his last 11 innings at home, and if the Indian captain gets one more, he'll become the first player to score three consecutive tons on two different occasions. Only Sachin Tendulkar and Desmond Haynes have scored three consecutive tons vs Australia. Last time, Rohit Sharma played at Mohali, he shellacked a whirlwind 208- his 3rd ODI double ton against Sri Lanka. Virat Kohli has scored 15 hundred since the start of January 2017. Australia has won five of their last ODI games at Mohali since 1997, but the last time they faced India at Mohali in a T20I, they felt the wrath of Kohli's bat as the right-hander scored a swashbuckling 82 not out, to knock them out of the 2016 World Twenty. A plethora of questions galore for Team India. Will KL Rahul get a chance in the playing 11? If yes, in place of whom: Dhawan or Rayudu? Will Bhuvneshwar come back in the side or will the wrist-spinners be reunited again? After claiming a rare win, Australia will be looking to field the same playing 11. They might, however, be tempted to play Jason Behrendroff in place of Nathan Lyon, considering the wicket.